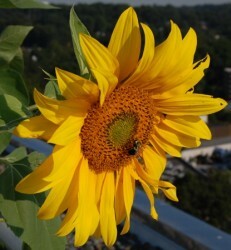 The sunflowers in my penthouse started blooming in August. Today, I harvested them. Most of the pollination was done by bumblebees. I did not see many honey bees in my garden this year. There have been reports that honey bees have been disappearing in massive numbers since 2006, forcing many beekeepers into bankruptcy. Scientists have been trying to find out what is causing what they call "colony collapse disorder" (CCD). Pesticides and viruses are suspected, but the mystery illness may stem from a bee virus that apparently spread to the U.S. from Australia in 2004. A genetic comparison of healthy and diseased bee colonies in the U.S. has revealed the presence of Israeli acute paralysis virus (IAPV) in almost all beekeeping operations affected by CCD. Bees are important because one-third of the U.S. food supply, including a variety of fruits, vegetables and even nuts, requires pollination by bees or other insects. Our global economy depends on the interchange of goods originating from diverse ecosystems. Pests and invasive species expand into new territories by the hand of man. Starlings, kudzu, zebra mussels, Dutch elm disease, and snakehead fish are just a few examples of non-native species imported to America. It is possible that the demise of the bees has been caused by the globalization of commerce. Flowering plants (angiosperms) developed approximately 115 to 125 million years ago during the Cretaceous Period. Bees evolved from the wasp family 100 million years ago. Bee fossils have been found in amber, which is petrified tree sap. Mysterious Honeybee Disappearance Linked to Rare Virus, Scientific American, September 7, 2007. 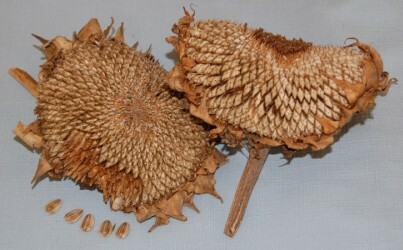 Do you grow many sunflowers? If this disappearance serious and as yet unresolved, there has to be other measures taken to encourage alternative pollinators. It's great you have bumble bees in your garden, but have you ever thought about encouraging solitary bees... they don't usually sting, nor do they make honey, but they can be very easy going and happy to take up nesting boxes if you get the conditions approximately right. They have a limited March to May activity, but they are very avid pollinators for fruit tree blossoms if you have them.